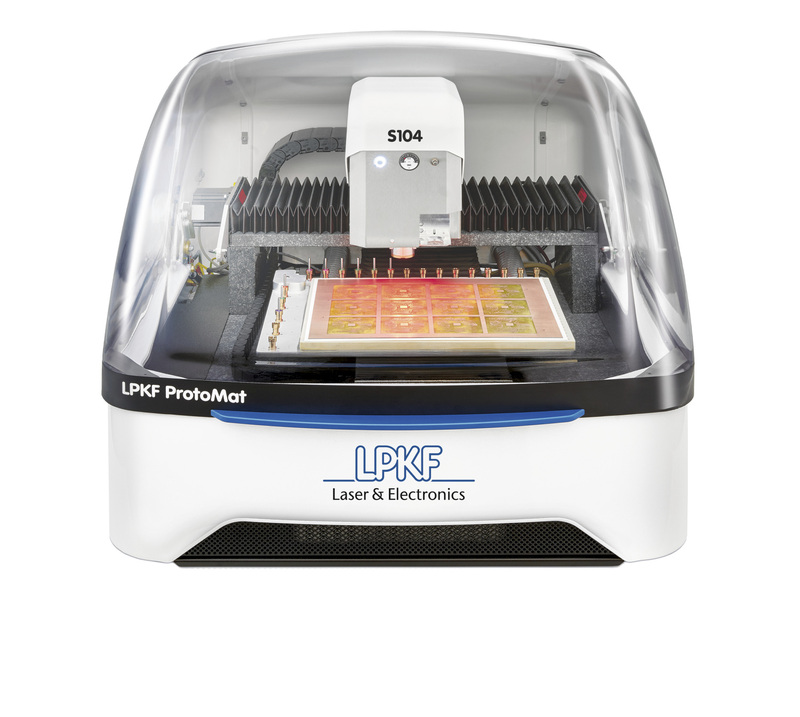 The LPKF ProtoMat S104 for PCB prototyping is fully equipped for the electronics laboratory. Thanks to the high-performance spindle and vacuum table, the system is suitable for RF applications, thin laminates and substrates with sensitive surfaces (conductor path widths as small as 100 μm). The system software considers the special requirements of RF materials. 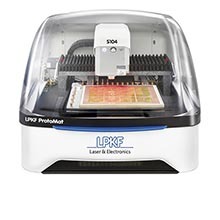 The ProtoMat S104 is particularly fast and precise due to the 100,000 RPM spindle motor which allows for higher travel speeds with a mechanical resolution of just 0.5 μm. In combination with the machine’s stable granite base, optimum accuracy is ensured for drilling and milling of even very fine features. The high-speed milling motor and the milling depth sensor are self-cleaning and therefore low-maintenance. 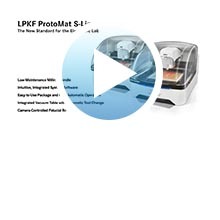 Automated operation makes things easy for users of the ProtoMat S104. The material and copper thickness are measured automatically by sensors which enable the exact calculation of the required milling depth. The machine, which is well equipped with 20 tool positions, automatically changes the corresponding tools during the production process. The automatic milling depth adjustment also ensures that any conical tools being used will always create a constant and correct width. 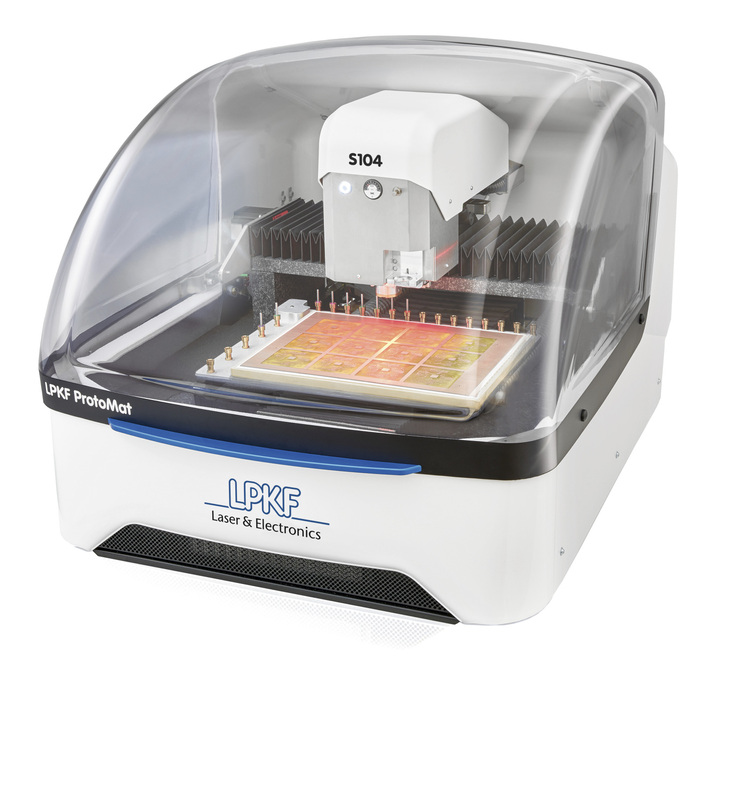 If required, the integrated dispenser can automatically apply solder paste to solder pads without any additional data preparation. The short set-up time and the operator-free machining enable the user to achieve short process times. With its Z-axis drive, the ProtoMat S104 is ideal for machining front panels and enclosures – or for pocket milling in printed circuit boards. 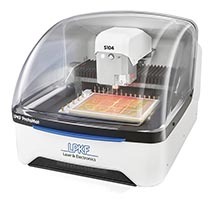 It’s also easy to machine assembled PCBs and to produce plastic or aluminum enclosures and faceplates. The system software in the ProtoMat S104 is highly flexible and easy to operate. The software is designed to meet the particularly high requirements of RF applications. A parameter library for different materials supports user-friendly operation.